A very active discussion on an allegedly Tesla Model 3 door alleges evidence of rust. 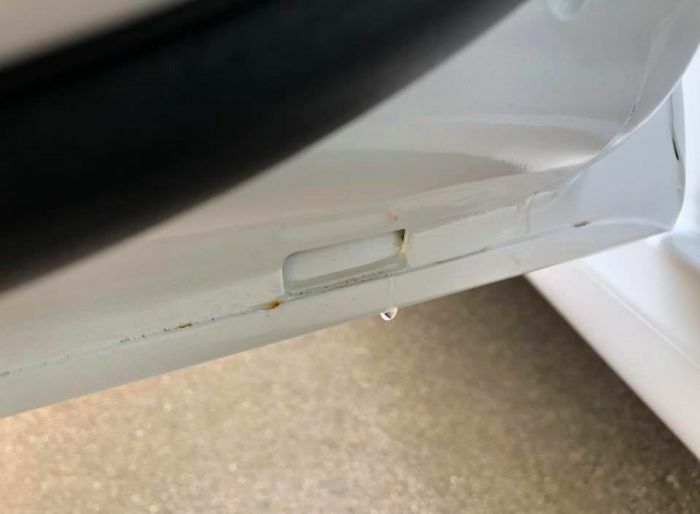 This afternoon Torque News received a tip from one of our readers sending this image from Imgur and pointing us to this Reddit discussion, which allegedly shows a white Tesla Model 3 door and rust on it. A user Ninja28, who says he is a Model 3 owner posted this image and made this comment. When I opened the passenger rear door on mine to retrieve something after driving through the rain for maybe 20 minutes a whole bunch of water spilled out onto my garage floor, might have something to do with the rust? I haven't noticed any rust on mine though. While it's hard to confirm if this is a Model 3 door, no one seem to contend that in the discussion. In fact, another user, named Malventano in the same discussion wrote something similar too. "This is my 3. Yes the door is aluminum. Took a strong magnet to the bottom of the door just in case there was steel in the edges - not ferrous. It definitely looks like rust and won’t rub off with a microfiber. Can only imagine it is a stain from rust runoff from something within the door. Will bring this up along with the next round of issues at the next service visit," commented Malventano. Then people share images of their own Model 3s. Some raise the question of how will these vehicles age in northern climates where salt is used heavily in the winter? This is a serious unknown. Here is a good video discussing if Tesla Model 3 will face Corrosion. Let's wait a while. Model 3 is a first year model car. See how Tesla responds and see how the car ages as the miles accumulate in the northern climates. Unlike the aluminum Model S and Model X, this is a steel car, so it's going to be vulnerable to rust. On the other hand, living near the ocean may make you vulnerable to rust as well even without winter due to salt spray (Sea salt aerosol (SSA)) from the ocean. I hope this is not related to the issue of flawed-parts issue that slowed down Tesla Model 3 deliveries in the past several months. Let us hear from you in the comments section below please. I have the same issue. My Model 3 is strangely accumulating water on the passenger rear door when I open it after it rains or when I wash the car. Is this normal? Will Tesla fix this if I take it in for service?